Aleppo is in the newspapers. Aleppo is in watering the houseplants. Aleppo is the pigeon sitting on the windowsill. It was on the bus from Qamishli that I first saw him. By and large he looked as any passenger would, with the only distinction to his appearance being perhaps the keffiyeh in red and white check that he wore. He was an Arab. But the keffiyeh is common in Syria so even that couldn't make him stand out in a crowd. He may have had a sort of downy stubble that stretched down his cheeks but failed to reach the promise of a full beard, when I think of it, and from the thinness of his face his bones may have given a stronger outline to his features. These traits, I suppose, lent him a look that was slightly avian. But it's easy to think such things now. When he took his seat on the bus which was, by happenstance, next to mine, there really wasn't any clue he was a man of the birds. To read about, Aleppo is a war zone: a battlefront of street fighting, bullets and shelling, a growing list of human casualties. But in the days of Hafez al-Assad when, in terms of daily life at least, normalcy seemed to prevail, the battle for Aleppo wasn't that. In those days there was a different type of battle, more of the feathered and wing variety and it was limited to the rooftops and the Aleppite skies. It's that earlier battle that's been waged in Aleppo for many centuries. In rather broken English we talked and I wish I could remember his name. When I asked, he spoke of trading: a business of some modest arrangement involving the carriage of goods for sale from Qamishli to Aleppo, or more likely from across the Turkish border. He spoke of his country, that once Syrians had been a people of great hospitality who prided themselves on hosting parties and socialising. In more recent years, he said, the culture had changed, with the sense of community weakening in part due to higher prices and living costs. Few people thought much about hosting celebrations any longer. But it wasn't these topics that engaged him and before much time went by he spoke instead of his passion, his pigeons. 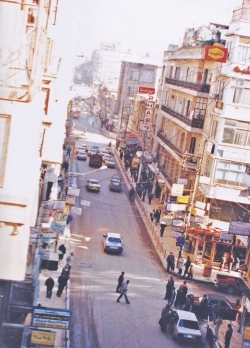 When the bus reached the city I saw he was a man of boxes, unloaded from the undercarriage onto the footpath, boxes of likely Turkish origins. I asked how to find a hotel; it was already late. He said if I wished I could stay at his house and I said if it would be no trouble I might just do that. Or at least I tried to say that in singular vocabulary. 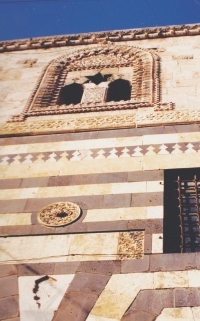 It was fine to be invited: perhaps he was in a small way recreating that older, more hospitable Syria. 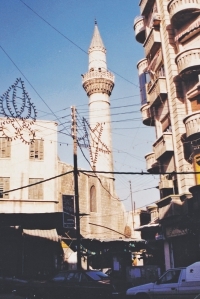 His apartment was in an old building, sandstone-like and of the type that sort of half-says Aleppo is one of the world's oldest continuously inhabited cities. Inside it had a broken decorative railing to its stairwell. He showed me to a metallic framed single bed in a longish room with a window at the far end. I gather he usually slept there but on that night it became the guest room. From the journey I slept easily. It was in the morning he took me to the rooftop. I found a space of perches and nesting boxes with a sizeable aviary on one side. He introduced me to his pigeons, pointing out the special or rare ones that I have no hope of describing now. They must have been of a different breed, with fluffier feathers or a fashionable colour. I'm not sure why but that morning he'd shaved the downy stubble off his cheeks. It can be that the stubble was a kind of feather-like reminder for when he travelled, or he may have wanted to look his best for his birds. He explained how he let his pigeons fly freely most of the time and tried to make their home aviary as comfortable as possible to encourage them back, and to encourage newcomers. He showed in the sky that circling pigeons were an Aleppite signature. Holding one pigeon in his hand, he held it up and then quickly dropped it down a little, giving rise to its instinct to flap its wings. Still in his hand it flapped with vigour and I understood that this was another way to attract new birds to his rooftop. It was the aim of every pigeon fancier in the city, to capture the best of the flock, in the more traditional battle for Aleppo. I wondered at his enthusiasm. It's not that there aren't worse hobbies, but what did it matter who had the best pigeons in the city? 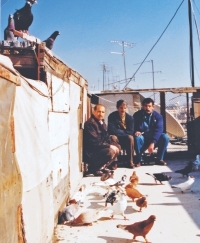 It seemed unusual how content he was to sit for several hours on that rooftop with his birds, how much anticipation there was for the day's expected visitor, a pigeon trader. I wanted to explore the city but I sat there too, in part enjoying the unusualness of finding myself on an Aleppite roof learning about pigeons and in part wondering what was the correct etiquette: when was too early to politely excuse oneself from pigeon adoration in order to be a tourist? Eventually I took my leave to visit the city. With not more than a few pots in the apartment in Dhaka it's hardly a garden I have. Each plant struggles through the periods of disinterest, wilting in the days and weeks of inattention drought; but they sprout anew when I decide to like them again. It's in the latter periods when Aleppo comes to mind. When a leaf is worth taking note of, when a stem marginally lengthened is pleasing, it becomes easy to appreciate the man who loved his pigeons. I wonder what he's going through now. Disclosure: author wishes to acknowledge that he did have pet birds in the past including doves. There was, however, never the kind of passion for it that the pigeon man had.